Now that real estate technology and software innovation is catching up with the modern business era, we are poised to see the next wave of service providers. Specialization in a particular product area helps launch successful companies, but there comes a point in time where real estate professionals want a single access point to handle the workflow. Password fatigue exists for a reason. Who wants a different login for their accounting, their property listings, and their contact database? Tech companies are listening and jumping to deliver all-in-one solutions that maximize efficiency and reduce expenses. Chime is designed for real estate brokers and agents as a lead generation. The platform uses social intelligence to supply insight into potential leads, automate certain processes and handle marketing campaigns. Chime’s advanced targeting technology assists with lead generation and coordinated social media marketing. Clients track sales activities to help manage brokerage teams. They provide an IDX mobile-responsive website with branding and listing syndication. The website includes a messenger chat box and a blog. Built by brokers for brokers, the all-in-one office software Realtybackoffice automates different processes to create an efficient brokerage environment. Some of the tools offered include transaction management, e-signing documents, e-forms library, brokerage management, agent management, commission tracking, and automatic escrow and disbursement agreement letters. The software integrates with other popular applications like Dropbox, Google Apps, QuickBooks, and various CRMs. Realtybackoffice can be customized to match branding. This purpose-built customer relationship management tool for the commercial real estate industry includes integration with other technology providers. Clientlook customers receive unlimited support and personalized training, although the CRM software touts itself as being training-free. The CRM offers more than a practical contact database; users track property ownership, manage listings, publish listings, integrate with marketing, track deals through the sales pipeline, and send reports to clients. Clientlook includes a virtual assistant team to help with lead capture and data entry. This all-in-one real estate software provider manages business from lead generation to reporting. Firepoint includes customized IDX search websites with branding. The team management is scalable and includes automated lead follow-up and scheduling, ROI reporting, search engine marketing, and more. Teams can control how leads are distributed amongst the members. Drip campaigns can be automated using preloaded workflows. The transaction management shows a detailed history of clients and closings. Juniper Square is essentially a CRM merged with an accounting tool to help commercial real estate managers and investors better manage their fundraising investments. The secure data storage protects sensitive information, while the personalized dashboard quickly updates investors on their portfolio status. Built by CoreLogic, AgentAchieve aids brokerages in handling real estate data and analytics to run their businesses more efficiently. Its tools include lead management, document management, a CRM, drip nurturing campaigns, instant response, customizable websites, and more. AgentAchieve works best for large brokerages. Commercial real estate professionals can manage pretty much everything about their business from any device with Apto. The CRM and deal management platform can be used by landlord or tenant representatives, investment sales specialists, or real estate generalists. Users can manage properties, see their listings, and handle back office work. Dashboards make it easy to see where something stands in the deal pipeline. Apto users can record notes about their meeting, and update their database with new information on contacts or properties. RealSpace handles listing management, transactions, and deals through a paperless management system. The software captures leads and qualifies them to help identify which ones to prioritize. The intuitive system includes an automatic match feature for the contact database. RealSpace offers customizable website templates specific to the real estate industry. Workflows automate on everything from client contacts to back office procedures. The CRM solution includes analytics and reports. 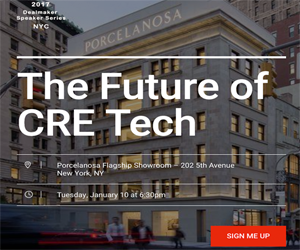 Come meet us in San Francisco on June 8th at CRE // Tech! Tickets are on sale now!